Have you ever built a web application with all of Telerik's beautifully skinned controls only to cringe at that basic button in your application? Or, have you built an application with a distinctly Vista look-and-feel only to have it destroyed by your basic form element styling on Windows XP and OS X? 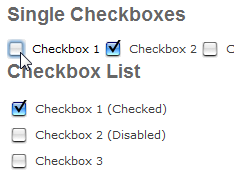 Today is your lucky day because today (well, yesterday) Telerik introduced skinnable form controls. Now you can extend that beautiful site skin to all of your page's elements - including buttons, checkboxes, and radiobuttons. The skinnable form controls are available as a Code Library project on Telerik's website, so you can download the bits today. At this stage, the controls are very basic. They have a few built-in skins- Mac, Vista, XP, Classic- and no built-in support for external skins (yet). The goal at this point is to gauge the interest in these controls and get some feedback from you so we know if the controls should become first class citizens in the RadControls for ASP.NET suite. Making the button hover work, transparent background skin files, and refactoring the code so that it can be called per. control inserted from script, and may I suggest using adding nodes instead of innerhtml (ye, I know it's just a test). Kudos to telerik again. I also requested this. This drives me nuts. Every project if I want to use a telerik skin I usually end up having to reskin some asp.net controls just to match. If this devleops, it will be a HUGE addition to the lineup.